It’s no secret that everyone loves tacos. You can fill them with whatever you want and eat about a half a dozen before you start to feel disgusted with yourself. 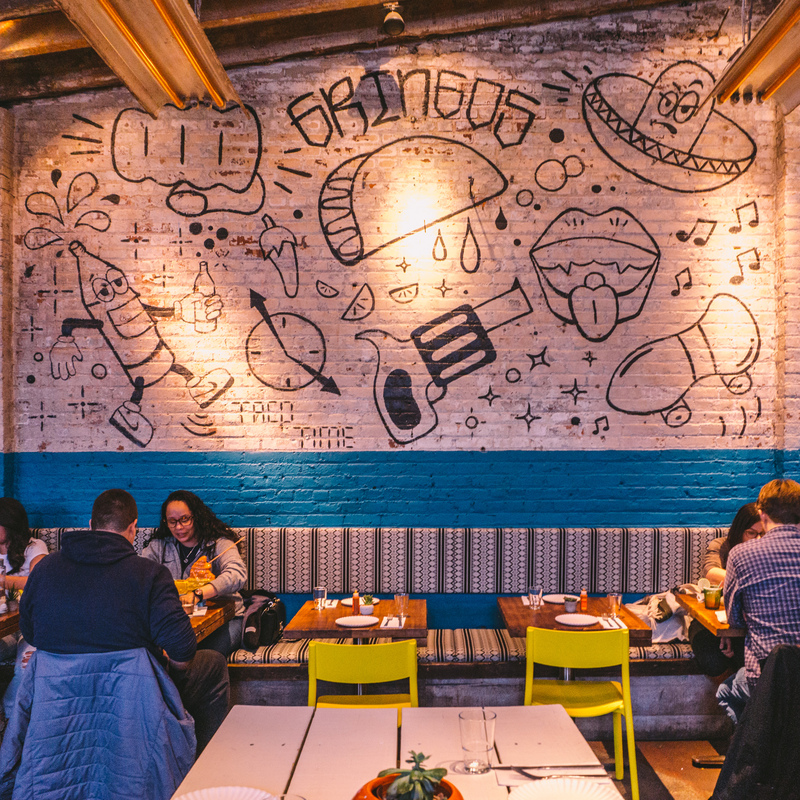 It is also no secret that there are a ton of really good taco spots in Jersey City. One of my favorites is a small mom and pop shop called Taqueria that has a lot of charm and not to far from the center of Grove Street. 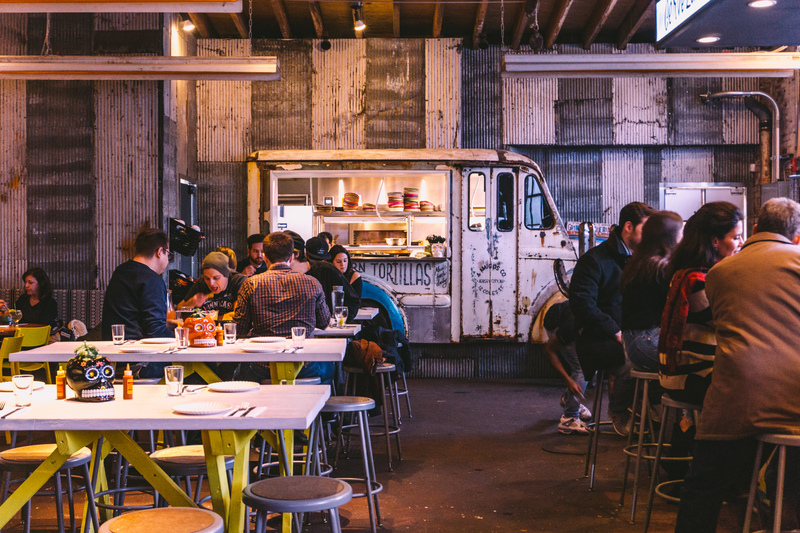 As more and more restaurants open up their doors, the competition continues to grow. This encourages restaurants to think hard about how they can stand out in this growing city. 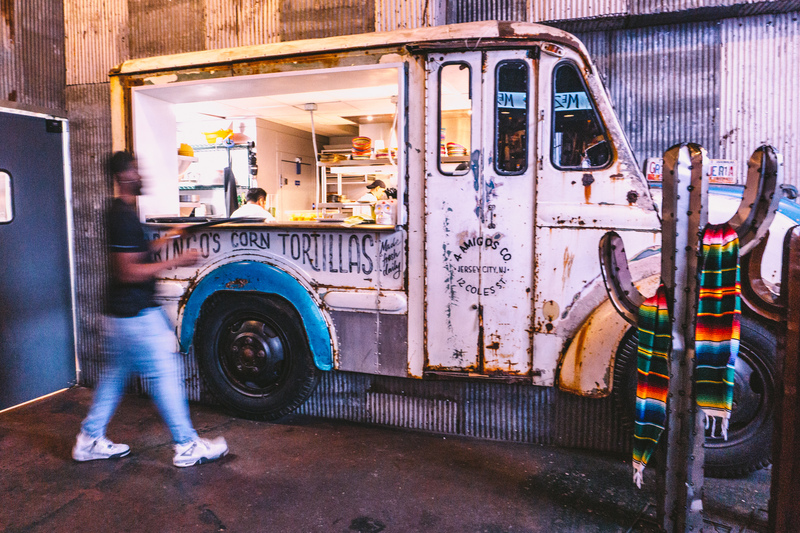 I recently visited Gringos’s Tacos in Jersey City. While it has some of the familiar traits of any other Mexican American restaurants, I think they were able to create something unique through their design choices. Starting off, I made my way to the bar and politely asked the bartender if I could see a menu. Each section of the menu used a distressed bold font accompanied by a more condensed thin font and something that resembled courier. There were also some illustrations throughout the menu used to fill in the negative space. These were ‘cute’ but I think they could have be arranged differently to create a more dynamic layout. The menu felt like any other menu at any other restaurant. It delivered information effectively to guests as it should. 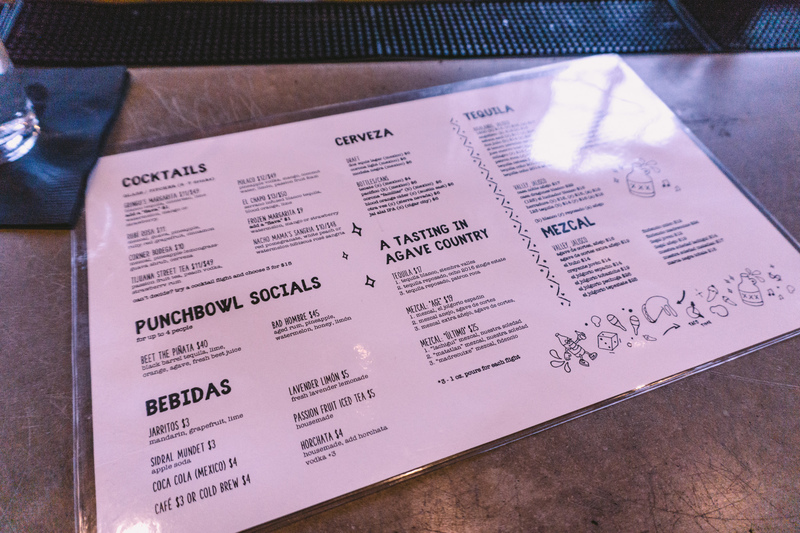 However, I think menus are a great opportunity to include personality and the menu at Gringo’s left me wanting more. After observing the menu I looked around and saw that the illustrations had also been painted on the back wall of the restaurant. They varied in size keeping your eyes jumping from one to the next. In addition to the illustrations there were also moments of beautiful hand painted lettering. Along the top of the bar were long white plastic illuminated panels, painted with types of drinks such as mezcal, margaritas, tequila, etc. showing a variety of scripts. Towards the back of the dining room was a rusted food truck. A side had been cut and fitted to frame the expo window of the kitchen. Along the side of the truck directly under the service window was another beautiful display of hand painted lettering. This time writing out ‘Gringo’s corn tortillas made fresh daily’. It was arched perfectly to fit around the wheel well of the truck. One of my favorite pieces in the restaurant. After wandering through the restaurant with my camera, fielding strange looks from tables, I began to retreat towards the front door. I passed sparkly sombreros, a neon sign, and a garden of succulents on the way out. All things I didn’t really notice when I first walked in. Before I end this post I wanted to add a section about things I would’ve liked to seen done differently. I loved the hand-drawn lettering that was all over and wish they would’ve done the same for the headers on the menu. I understand it may have been a little easier to lay the menu out using the font they have currently. However it’s not quite the same typeface as the ‘Gringo’s’ wordmark and they were so few sections that this could’ve easily been made possible. I wish there were some more relevant illustrations used in the restaurant. Theres some tacos, some ingredients, a skateboard, and then there was a gun. This felt a little out of places and I think there could have been a more closely related set included. This note is more of a ‘nice-to-have’ but I wish there were more branded moments/swag to interact with. Items like printed napkins, coasters, engraved glasses, tray liners with taco illustrations, maybe even taco bibs?!? I think they could have been really experimental with the visual elements they currently have and it would have only added to the overall experience. In the end I really enjoyed Gringo’s. It may not be my favorite bar in Jersey City. It still did a really good job with creating a unique dining experience in a very ‘hip’ part of town. I recommend checking it out for yourself and letting me know what you think. Tag me on instagram in your post or story when you visit.